Guard Frankie Sullivan underwent knee surgery today in Birmingham to repair a torn ligament. No timetable has been given for his return. The HOT RUMOR–the HOT, TOTALLY DEPRESSING RUMOR–is that the ligament in question is, as you might expect, the ACL. If so, Frankie’s all-but-certainly done for the 2010-2011 season. The silver lining here, I guess, is that regardless of whether Sullivan was healthy or not, this season was going to be about the new arena and taking Auburn’s first steps towards respectability, not reaching any particularly lofty goals. 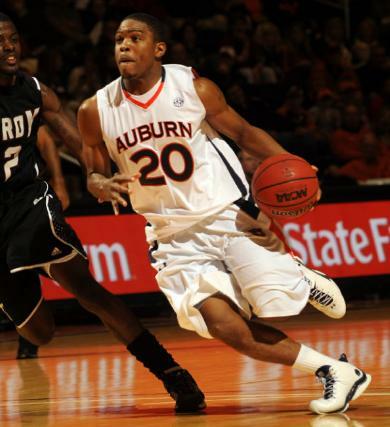 If Sullivan can come back healthy, with the extra experience gained by his replacements, 2011-2012 will be the year Barbee can actually start to take Auburn somewhere. Frankie’s highest-stakes basketball remains ahead of him. Of course, that’s only the lining on the giant, murderous-looking thunderhead that is a terribly young team now missing its most experienced, hardest-working, most popular player … not to mention the guy that was probably going to man the point. Barbee’s decision at the 1 will likely now come down a walk-on and a true freshman who (while promising) had to decide between Auburn and Buffalo. Who’ll run the offense for a team now lacking any player who averaged more than 13 minutes a game last year. Good times. It’s still going to be a fascinating, and mostly enjoyable, season of Auburn basketball. There’s the arena. There’s getting to know our new coach. There’s the wave of freshmen who should, God willing and the creek don’t rise, offer us hope that this is the roster, the regime, and the building that will finally make Auburn men’s hoops relevant for more than the occasional one-off season every seven years. The pressure will be off, the stress low, the only expectations how firm a foundation this team can build for the future. But without Frankie Sullivan, Barbee will have to be nothing less than a true hoops wizard for it to translate into a postseason berth or winning record. Truly, whatever Auburn has done to tick off the basketball gods so royally, it must have been one hell of a sin. I’m with you, Jerry. I happen to think that there may be a silver lining as well. This season would have been a wasted one with or without Frankie anyways. Possibly now, we can get some seasoning for the freshmen, and then bring Frankie into the fold next year. I don’t think it’ll take Barbee long to put a quality product in the Arena. So, perhaps this’ll be a blessing in disguise instead of penance for our sins. WDE…37 days! Even if he redshirts and it is a blessing in disguise for the future, I think it’s a blow right now. Everybody loves Frankie! We’ll be welcoming 5 new faces to the court… they won’t know us and we won’t know them. The first few games will be like awkward first dates. Auburn has a basketball team? Just kidding, frankie was my favorite. Wish him well on recovery. I would love to have a BB program again.